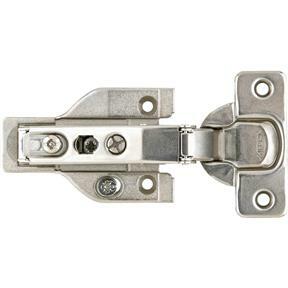 All purpose hinge is self-closing and gives ample room for accessibility. Top quality hinge. Maximum door thickness is 7/8" (22mm). Completely adjustable. Easy snap on/off for door removal. Bought cabinet hinges and Grizzly carries good quality products. Thank you! Product was great and fit perfect. Service was great too. Plan to order more. Yes I bought these because the mount for the cabinet face broke on yet another one of my custom cabinets. Instead of having to retro fit other hinges, I replaced the broken mount and snapped in the door side and repair was made in 3 minutes. Purchased 5 more in case my kids break another one down the road.